How do we as performers make the journey from not able to ready to perform and beyond? How can Human Performance Technology (HPT) practices help remove friction and improve the environments where this journey happens? If we don’t all have the same idea for what the pathway looks like, how can we work together to efficiently help the performer ascend to the levels they need to reach and heights that they aspire to? While I’m not sure it’s always necessary, I think it’s important to create some sense of consistent gravity around critical anchors in the language of our discipline. Skill, proficiency, and expertise are among the concepts I would consider to be critical in a field that exists to support, facilitate, and improve the things that these terms represent. In this case the mechanisms by which we help folks climb the ladder, navigate pathways, and make connections seems to be more more important than the meaning of the terms (levels) themselves. The post is still going to be about the lexicon for competence, proficiency, expertise, and mastery but it’s going to cover a bit of ground in the process. I had been planning to read an article written by ADM Robert J. Papp , Jr. titled Proficiency: The Essence of Discipline for a few weeks. I’ve known ADM Papp for a few years and he’s one of the many people I admire. His views on experience and proficiency have informed my own. 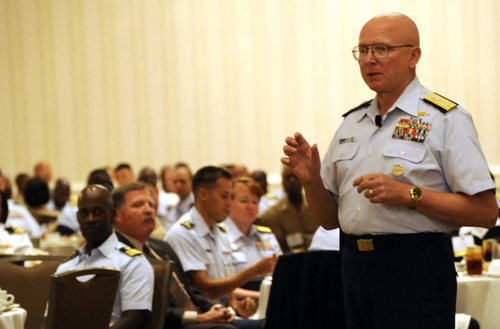 As an organizational leader (he’s the four star Admiral in charge of the USCG and a genuinely cool dude), the Admiral walks the talk and the steps he’s outlined are indeed in motion. The article did not disappoint. I recommend giving it a read. This excerpt from ADM Papp’s article encapsulates the problem nicely. I began speaking of proficiency in my first “State of the Coast Guard” address in early 2011, and it generated a flood of questions. During all-hands meetings last year, I frequently was asked to describe “proficiency.” I would reply by recounting how during a visit to a Coast Guard boat station I had asked the crew, “Who is the best boat coxswain?” Of course half a dozen boatswain’s mates immediately raised their hands. So I rephrased the question. “If the search-and-rescue alarm sounded and you had to go out in a severe storm, who would you want to be the coxswain of the motor lifeboat?” Everyone turned and pointed to the commander, a chief warrant officer boatswain (BOSN4) and surfman with more than 30 years of experience. Clearly, we all know proficiency when we see it. But how do we become proficient? And proficient at what? Do we have a common language for the steps in skill acquisition? As I read ADM Papp’s article, it struck me that while we often talk about proficiency, skill, and expertise in my field, we might not have a common idea for what these terms represent. If we don’t have a common concept for the meaning, it could be difficult for us to agree on the mechanisms we use to facilitate (or know when to get out of the way and trust in the strength of the network or the individual). When do we mediate and intervene? When do we let go? Tough questions if we don’t agree on the model for what skill progression looks like. I talked about my views on the place “skills” live in the great network of being in Make the Structure Visible. For the purposes of this discussion, let’s assume that the outcome is the goal and the skill is one of the means to reach the goal. Let’s also assume that most, if not all, skills can be categorized with multiple different levels of mastery. To start, let’s riff off of an inspiring post by Craig Wiggins with some martial arts flavor. These are probably some of the oldest mastery development models in existence. Ancient disciplines seem like a good place to start. The definition of levels is one facet, but looking at the model, the real value of the definition is in the mechanisms that bridge from one level to the next. Shuhari comes from a Japanese martial art concept that illustrates progression for attaining mastery through disciplined learning. shu (守) translates as protect or obey. In the context of Japanese martial arts, this is where learning progression begins. These foundations represent learning fundamental techniques, heuristics, and proverbs. During this stage, the subject of the discipline does not deviate from the forms presented by a single instructor. ha (破) translates as detach or digress. This is where learning progression expands beyond the foundations and the subject is encouraged to innovate and break free of the rigid foundations. During this stage, the subject explores the application of the foundational forms, making some forms their own and discarding others. ri (離) translates as leave or separate. In this stage, the subject completely departs from the discipline of the forms and opens themselves to creative techniques that align with the desires of the heart and mind within the bounds of laws, rules, and values. The subject is encouraged to use what they have acquired during shu and ha to transcend teachings and acquire mastery, making their own connections and relationships to the discipline. Chinese martial arts such as Wushu also offer a three-phase mastery concept. Sky – No conscious thought. It looks like the concepts of defining states or levels along the path to mastery have been around for a while. These relatively simple models represent a disciplined progression and transformation from novice to apprentice through to journeyman and master. I’ve long held my own categorization for levels of performer across three dimensions: Selection, interpretation, and execution. Following novice through master, each level is matched with a more colloquial label. Novice is matched with the label Burden since it can be a challenge to find the right resources to grow a novice. This isn’t meant to be an insult to the novice. Everyone has to start somewhere. This merely implies that the development of the novice can be a larger draw on an organization’s resources than the development of the higher levels. That doesn’t prevent a senior performer from regressing or not growing beyond the novice level. We don’t always do the Novice relationship (opportunity) justice. The burden level is about exchange of value. When considering a person that’s new to an organization, training and patience are an investment in future returns. It’s purely coincidental, but this is really similar to the Shuhari model of progression through mastery. The chart describing this model represents three main activity areas: selection, interpretation, and execution. I still like this model for some types of work but I don’t think it’s good enough to map into a common lexicon. This model of skill acquisition comes from Hubert Dreyfus, a philosopher and educator. The original model proposed that people pass through five stages in pursuit of skills: novice, advanced beginner, competent, proficient, and expert. This was later revised to encompass seven distinct stages. Novice A novice is just learning the basics of a subject, unable to exercise discretionary judgment and has rigid adherence to taught rules or plans. Advanced Beginner The advanced beginner is beginning to connect relevant contexts to the rules and facts they are learning. Folks at this level may have no sense of practical priority. All aspects of work may be treated separately and will likely have equal importance. Competent A competent performer is able to select rules or perspectives appropriate to the situation, taking responsibility for approach. Proficient A proficient performer has experience making situational discriminations that enables recognition of problems and best approaches for solving the problems. At this stage, intuitive reactions replace reasoned responses. Expert The expert performer is able to see what needs to be achieved and how to achieve it. This level of performer is able to make more refined and subtle discriminations than a proficient performer, tailoring approach and method to each situation based on this level of skill. Master The mastery performer has developed their own style, extending expertise within a domain with their own synthesis of tools and methods. Practical Wisdom This level was tacked on later at the behest of a colleague. This describes the assimilation of the master’s creations within the culture of a work unit or organization. In my interpretation, this is the closure of the cycle and describes the giving back from the master to the domain, enhancing the domain body of knowledge itself. Let’s focus for a moment on the four levels in the middle: competence, proficiency, expertise, and mastery. These represent the progression from confidently able (decreased burden on the system – returns are beginning to emerge), intuitively able (solver), to crazy able (synthesizer), and beyond. While I like this model, it doesn’t seem to offer a solid definition of the behavioral components of proficient, expert, or master. If it matters that these levels are attained, what signifies each milestone for a particular skill? How are these levels distinct? Competence: The ability to perform a requisite range of skills. Contextualization: Knowing when to do what. Contingency: The flexibility to cope, adapt, and respond when things go wrong. Creativity: The capacity to solve novel problems. I’m not sure these round it out for me completely, but these do clarify the borders of meaning between these terms. To be useful, the definitions should ultimately define a clear distinction among proficiency, expertise, and mastery that sets these levels apart from the threshold of competency. One question that seems to surface often, one that I’ve brought up as well, is the importance of skill mastery beyond performance competence. How important is mastery beyond performance competence? I think the answer is “it depends” but it seems like there’s a consistent human drive that requires a goal beyond status quo for satisfaction in life (including life at work). If we don’t define what those goals could look like and don’t set our expectations higher, we risk performance competence becoming the high water mark in organizational performance expectations. Shouldn’t performance competence be the minimum standard? I think holding a common understanding of what each of these levels mean could help to better communicate relationships. The value of this common thread transcends the relationships between the levels. A common understanding could help us better map the what, when, and why of how we help folks navigate the journey from no skill to skill mastery or any stop in between. Let’s continue the conversation. Does Dreyfus’ model resonate with you? What have you found? Does this matter as much as I think it does? This is probably ancient (in internet terms) but I like the synthesis expressed here. I’m curious though – I don’t have access to the Hubert Dreyfus work cited, but I have been familiar with the five levels toward mastery. I believe they were originally expressed by Robert J. Trotter in an article in the July 86 edition of Psychology Today. Trotter co-authored a “simple” textbook about psychology in the ’70s. But, since Dreyfus is much older than Trotter (who I’m not sure is still with us), it is also possible he learned of it from Dreyfus. I teach military trainers and educators how to create learning opportunities that lead toward mastery. This progression – and some of the attendant characterizations are sometimes useful. I also find it useful to use Ackoff’s idea of learning that flows from data, information, knowledge, understanding, wisdom. The idea being the translation effects that occur between these steps. Another useful model is Dr. Rita Smilkstein’s Natural Human Learning Process that suggests progressive steps that lead to mastery. She suggests learning begins with some form of motivation, which leads to beginning practice, advanced practice, skillful practice, refined practice, and then mastery. In the end though, because of the imprecision of our language in regular usage, rather than pin a single definition to these different levels, we acknowledge that there are intermediate levels between novice and mastery and we use descriptive and aspirational terms to describe performance in assessments. Pretty much what Admiral Papp (and most other military leaders) does intuitively. Thanks for the comment, Blaise! Good references. Will look at the Trotter refs and update if something is out of order. I like the Ackoff flow as well. Thanks for the tip on Dr. Smilkstein’s work. Since publishing this, I’ve thought about it a bit and I think your reference to aspirational labels associated with performance are right on. Novice, mastery, or somewhere in between. The label is contextual to the domain. Another important aspect of progression that seems important is that proficiency is simply defined only in narrow terms. Progression through a domain tree very quickly reveals complexity and heavy variation outside of a very focused performance measure. In most skill progression, choices are made that affect specialization / focus. In cases like these (which could be applied to practically any domain) it almost seems futile to attempt precisely label proficiency. Nice link! And a great metaphor for one of the greatest challenges developers and trainers face – broadly gauged generalist for an uncertain world or tightly focused specialist that leads innovation to solve tough problems. Most of us will agree that we need both, but resources conspire against achieving either. So we muddle in the vast middle and hope for the best. So I was energized to discover the source of the five step mastery model. It had been years and years since I had the source document that led me to write the bibliographic entry on the 3×5 card (am I dating myself?) and I no longer had it, yet I couldn’t remember any reference to Dreyfus. Bless the librarians, because one found me the Trotter article from a 1986 volume of Psychology Today magazine. And, indeed, Mr. Trotter did refer to Hubert Dreyfus (and his twin brother Stuart) and their book Mind over Machine. So, your research / reference skills have great power, I am not worthy. A further note – I presented at the 2012 USCG HPT conference talking about Outcomes-based Training and Education and met lots of folks, I wonder if we crossed paths? Because outcomes seems to have such an academic flavor, we now describe it as “Adaptive” Soldier Leader Training Education which seems to resonate better. Same processes and philosophy, different label. But now we try to get developers, managers and instructor/facilitators to think more about developing “competencies” in addition to developing knowledge and skills. It is the combination of knowledge, skills and attributes that build a comprehensive picture of what the Soldier (in my work environment) knows, is able to do, and behaves. I think you will make an instant connection to what you describe to Nancy in the post below. I think (hope) that teachers and developers at secondary and collegiate levels are beginning to examine the quality of the learning environments they create for their learners. National standards are a bit grandiose and overwhelming, but do remind educators that content matters. More importantly, creating opportunities for development to do something with that content is even more important. What still remains is to provide future employers or users an assessment of a learner’s capability AND capacity so that they can make rational decisions about placing in their organization where they “fit” and where they benefit the organization. Which brings us back to usable scale to rank learning & performance. Thanks for the sounding board. Thank you for this article! I came across it while researching Learning Paths which relying on the term ‘proficiency’ heavily but I find that it doesn’t define it well. Your information on the Dreyfus model was a key component to pieces things together in a way that I can explain to clients. I’m also reconsidering learning paths to be something where we need to determine what level the learner needs to be trained to instead of assuming proficiency. I believe capacity is a really broad spectrum. We typically think of capacity in terms of skill, which why training seems to come up so much:) If we think beyond skills (commonly equated to technique) to a richer set, we might come up with confidence, experience, connections, insight, empathy, grit, and more. Similar to (and in some cases equal to) competencies. “Meta” to specific proficiencies, these might be better leveraged as focal points. By breaking down to components of behavior, we might be able to make more precise mappings to opportunities. Opportunities that fall across multiple overlapping categories. Categories like Discover, Create, Connect, Lead, Achieve, Apply. Within these categories, we see elements of training. But we also see beyond training to a rich set of opportunities, some formal and some informal. Great article. I have been working on same lines of differentiating proficiency from other levels. Lately organizations have woken up and started making ‘proficiency’ as their training goal. However, not all organizations are good with defining proficiency. Some have never even thought about it. I recently wrote an article on emphasizing why ‘proficiency’ should be the goal of the organizational training (http://www.personal-resonance.com/3-challenges-in-training-design-in-the-pathway-to-proficiency-as-organizational-training-goal/) and very recently I wrote another one why ‘accelerating’ this proficiency is crucial to organizations (http://www.personal-resonance.com/accelerating-time-to-proficiency-metrics-important-todays-business-world/). I also wrote a 6 part series differentiating between knowledge, skills, competence, proficiency, performance, expertise and mastery (http://www.personal-resonance.com/part-i-knowledge-to-abilities-are-you-differentiating-yourself-from-the-crowd/). I think core of the challenge is also that training professionals speak training language and proficiency goals are not always considered. We need to shift our thought process to look for total holistic solutions to provide required experience to develop learners to “proficiency” (no matter how the mix of training plus non-training solutions looks like). All my thoughts, grounded in research, resonant with your thoughts here. I am glad to find someone whose thoughts are similar to mine. Feel free to have a look at what I write. In the meantime I am going to share this article with my network. I think it is very useful.